Amyotrophic lateral sclerosis (ALS), also known as Lou Gehrig's disease and Charcot disease, is a specific disorder that involves the death of neurons. The cause is not known in 90% to 95% of cases. There is no cure for ALS. ALS, or amyotrophic lateral sclerosis, is a progressive neurodegenerative disease that affects nerve cells in the brain and the spinal cord. A-myo-trophic comes from the Greek language. "A" means no. "Myo" refers to muscle, and "Trophic" means nourishment – "No muscle nourishment." When a muscle has no nourishment, it "atrophies" or wastes away. "Lateral" identifies the areas in a person's spinal cord where portions of the nerve cells that signal and control the muscles are located. As this area degenerates it leads to scarring or hardening ("sclerosis") in the region. 2018 - Abstract ~ Analysis of endocannabinoid receptors and enzymes in the post-mortem motor cortex and spinal cord of amyotrophic lateral sclerosis patients. Spain: Journal of Amyotrophic Lateral Sclerosis and Frontotemporal Degeneration. 2018 - Abstract ~ Evaluation of 4-oxo-quinoline-based CB2 PET radioligands in R6/2 chorea huntington mouse model and human ALS spinal cord tissue. Switzerland: European Journal of Medicinal Chemistry. 2017 - Study ~ Essential Dietary Bioactive Lipids in Noninflammatory Diseases. Italy: Antioxidants & Redox Signaling. 2017 - Abstract ~ Evaluation of monoacylglycerol lipase as a therapeutic target in a transgenic mouse. 2017 - Study ~ Up-regulation of CB2 receptors in reactive astrocytes in canine degenerative myelopathy, a disease model of amyotrophic lateral sclerosis. USA: Disease Models & Mechanisms. 2016 - Abstract ~ Pain in amyotrophic lateral sclerosis. 2016 - Study ~ Gingival Stromal Cells as an In Vitro Model: Cannabidiol Modulates Genes Linked with Amyotrophic Lateral Sclerosis. 2016 - Study ~ Can cannabinoids be a potential therapeutic tool in amyotrophic lateral sclerosis? 2016 - Study ~ Acetylcholine receptors from human muscle as pharmacological targets for ALS therapy. USA: National Academy of Sciences. 2016 - Study ~ Targeting Cannabinoid CB2 Receptors in the Central Nervous System. Medicinal Chemistry Approaches with Focus on Neurodegenerative Disorders. Spain: Frontiers in Neuroscience - Neurodegeneration. 2015 - Abstract ~ Endocannabinoids in Multiple Sclerosis and Amyotrophic Lateral Sclerosis. Handbook of Experimental Pharmacology: Endocannabinoids. 2015 - Study ~ Changes in the endocannabinoid signaling system in CNS structures of TDP-43 transgenic mice: relevance for a neuroprotective therapy in TDP-43-related disorders. 2015 - Abstract ~ Cannabinoid Signaling and Neuroinflammatory Diseases: A Melting pot for the Regulation of Brain Immune Responses. 2015 - Study ~ Cannabinoids in Neurodegenerative Disorders and Stroke/Brain Trauma: From Preclinical Models to Clinical Applications. 2015 - Study ~ Narrative review of the safety and efficacy of marijuana for the treatment of commonly state-approved medical and psychiatric disorders. Addiction Science & Clinical Practice. 2014 - Abstract ~ Changes in Endocannabinoid Receptors and Enzymes in the Spinal Cord of SOD1G93A Transgenic Mice and Evaluation of a Sativex -like Combination of Phytocannabinoids: Interest for Future Therapies in Amyotrophic Lateral Sclerosis. 2014 - Study ~ Cannabinoids: New Promising Agents in the Treatment of Neurological Diseases. Italy: Open Access - Molecules Journal. 2014 - Study ~ The endocannabinoid system: a putative role in neurodegenerative diseases. Italy: International Journal of High Risk Behaviors & Addiction. 2013 - Study ~ Interplay of cannabinoid 2 (CB2) receptors with nitric oxide synthases, oxidative and nitrative stress, and cell death during remote neurodegeneration. 2013 - Study ~ Amyotrophic Lateral Sclerosis Treatment with Ultramicronized Palmitoylethanolamide: A Case Report. 2013 - News ~ Patient pitches medical marijuana at Fla. Capitol. 2012 - Study ~ Single-dose Pharmacokinetics and Tolerability of Oral Delta-9-Tetrahydrocannabinol in Patients with Amyotrophic Lateral Sclerosis. 2010 - Study ~ Cannabis and Amyotrophic Lateral Sclerosis: Hypothetical and Practical Applications, and a Call for Clinical Trials. 2010 - Study ~ The endocannabinoid system in the inflammatory and neurodegenerative processes of multiple sclerosis and of amyotrophic lateral sclerosis. 2010 - Study ~ Abnormal sensitivity of cannabinoid CB1 receptors in the striatum of mice with experimental amyotrophic lateral sclerosis. 2010 - Study ~ The endocannabinoid system in gp120-mediated insults and HIV-associated dementia. 2010 - Study ~ Tetrahydrocannabinol (THC) for cramps in amyotrophic lateral sclerosis: a randomised, double-blind crossover trial. 2010 - News ~ Marijuana May Extend Life Expectancy Of Lou Gehrig's Disease Patients, Study Says. 2009 - Study ~ Emerging Role of the CB2 Cannabinoid Receptor in Immune Regulation and Therapeutic Prospects. 2009 - Study ~ Cannabinoids as Therapeutic Agents for Ablating Neuroinflammatory Disease. 2009 - Study ~ Cannabinoids and neurodegenerative diseases. 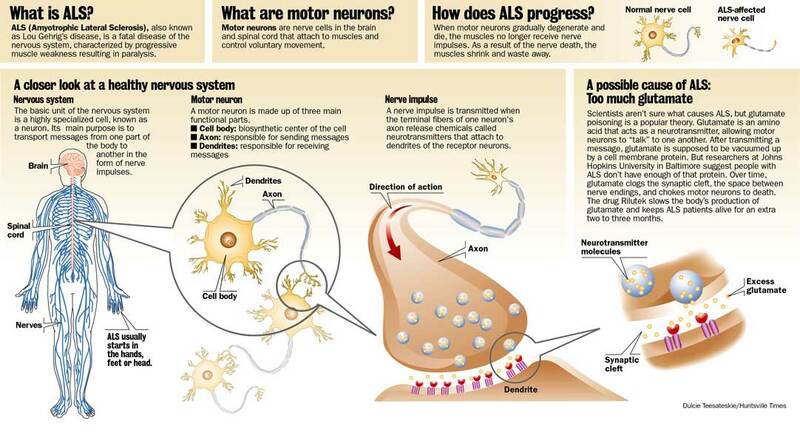 2009 - News ~ Medical Marijuana and Amyotrophic Lateral Sclerosis (ALS). 2009 - News ~ Medical Marijuana and Lou Gehrig's Disease. 2008 - Study ~ Altered presymptomatic AMPA and cannabinoid receptor trafficking in motor neurons of ALS model mice: implications for excitotoxicity. 2008 - Study ~ Role of CB2 receptors in neuroprotective effects of cannabinoids. 2007 - Study ~ The CB2 cannabinoid agonist AM-1241 prolongs survival in a transgenic mouse model of amyotrophic lateral sclerosis when initiated at symptom onset. 2006 - Study ~ Increasing cannabinoid levels by pharmacological and genetic manipulation delay disease progression in SOD1 mice. 2006 - Study ~ AM1241, a cannabinoid CB2 receptor selective compound, delays disease progression in a mouse model of amyotrophic lateral sclerosis. 2005 - Study - Cannabinol delays symptom onset in SOD1 (G93A) transgenic mice without affecting survival. 2004 - Study ~ Delayed disease progression in ALS mice by treatment with a cannabinoid. 2004 - Study - Cannabis use in patients with amyotrophic lateral sclerosis. 2004 - News - Cannabis' Potential Exciting Researchers in Treatment of ALS, Parkinson's Disease. 2004 - News ~ Cannabis Relieves Lou Gehrigs Symptoms - New Study. 2004 - News ~ Marijuana-like compounds may aid array of debiliating conditions ranging from Parkinson's to pain.